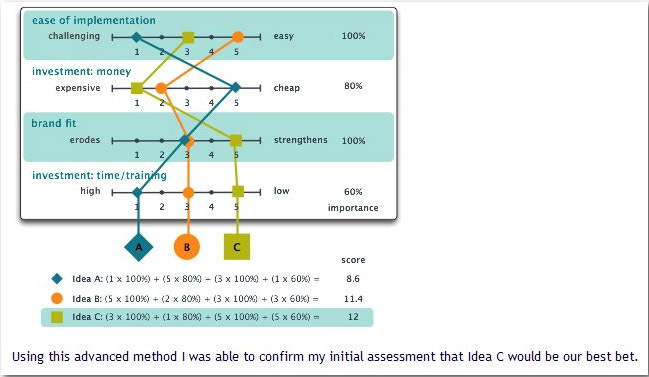 A reader sent me the following display, which was developed by a fellow named Paul Williams to provide companies a way to determine the best of multiple options (ideas A, B, and C in the example below) across differently weighted variables (ease of implementation, etc.). When lines are used to display quantitative data, people focus on the pattern that they form, but with discrete variables such as these, which can be arranged in any order, the patterns formed by lines are meaningless. Bars help people focus primarily on the magnitudes of individual values and how they compare to one another, which is the right way to read this information. As you can see, the lengths of the quantitative axes on these graphs have been scaled to reflect their differently weighted values. As such, people can meaningfully compare the lengths of the bars in each of the graphs to see their relative scores. I have encoded the Overall scores (the most important information) graphically and made them a darker color so that they stand out as different from and more important than the individual variables. Unlike the original display, which only has one small section of three numbers that are useful and not misleading, all of the content in this redesign is meaningful and helps people see how the variables relate to the final conclusion.